The vintage (antique) engagement rings dates back to the early 18th century. 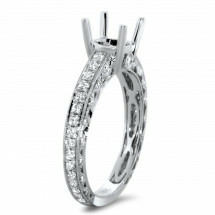 Vintage is a term to describe a style or era, where a true antique engagement ring is a minimum of 50 years of age. Any engagement ring made before 1960 is an antique, but its vintage style or the era it represents depends on how the ring was made. The Georgian style engagement ring reflected the limited resources of the day. The vintage engagement rings were made of yellow gold with fine intricate metal works. What identified the era the most was the use of ribbon and butterfly designs, but the designers of the day were also influenced by Greek architecture and design using wheat stalks, doves, acorns, scrolls, and flowers in their designs. The Victorian Engagement Ring era is marked by Queen Victoria's love for diamonds and her reign from 1837-1901. Victorian designs were a dramatic improvement over the Georgian. The styles were large and colorful using gemstones and clusters of diamonds. Victorian Engagement Rings would use multiple colors in the same design, not a style we see today. 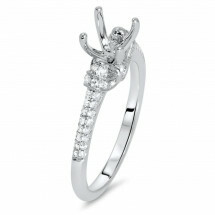 The Victorian designs incorporated snakes (a sign of everlasting love) and Celtic symbols. 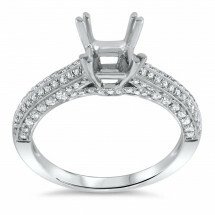 Custom designing a Victorian Engagement Ring today has incorporated Celtic designs and diamonds. 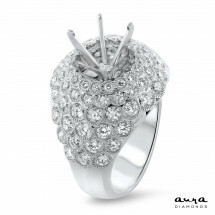 We are seeing fewer gemstones used in these designs. By the start of the 20th century ring designs changed to a lighter design with the use of filigree called Edwardian Engagement Rings. The use of filigree is a truly creates vintage look, with thin flowing lines and light look. 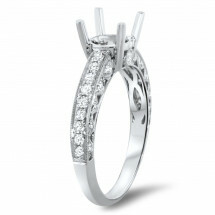 Edwardian Engagement Rings were often made in platinum and it is this era that made platinum popular. 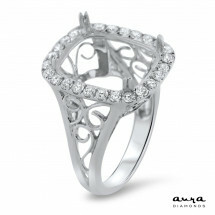 Today platinum and filigree are often used to give jewelry an antique look. The Edwardian era did not last long, most believing about 10 years, but it has left an indelible place in fine jewelry and engagement rings. 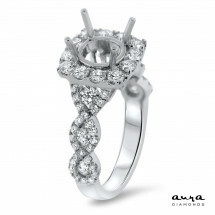 Custom Vintage Engagement Rings are still in demand today but we are seeing less platinum and more white gold designs. Vintage Engagement Rings evolved during the time of the first world war. The Industrial Age was in full swing and an artistic movement was growing. 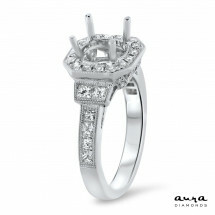 Around 1915 Art Deco Engagement rings were introduced. These rings reflected the Edwardian rings from a decade earlier but had more geometric designs. Art Deco was everywhere and looked like it was here to stay, but hard economic times in the United States in the 1930s, an uneasiness in Hollywood and a growing disturbance in Europe left consumers making more economical choices. 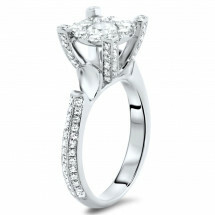 Custom Art Deco Engagement Rings are still in demand influencing designers today.